This construction video tutorial is created on Concrete Mixes. Various topics like categories of mixes, purpose for using mixes. 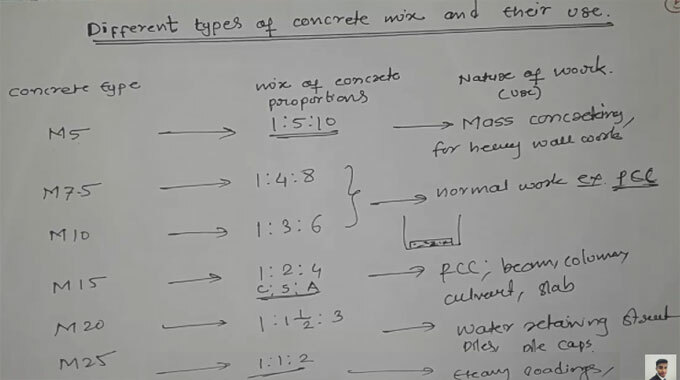 Fundamental types of the concrete mix range from nominal mix, standard mix and design mix. There are different types of grades for concrete mixes like M5, M7.5, M10, M15, M20, M25, M30, M35, M40, M45, M50, M55, M60 as per IS 456-2000. The grades of concrete stand for the ratio with which the components of concrete i.e. cement, fine aggregate (Sand) and coarse aggregate is blended. IS 456-2000 has designated the concrete mixes into a number of grades as M10, M15, M20, M25, M30, M35 and M40. In this designation the letter M stands for the mix and the number to the stated 28 day cube strength of mix in N/mm2. The mixes of grades M10, M15, M20 and M25 resemble roughly to the mix proportions (1:3:6), (1:2:4), (1:1.5:3) and (1:1:2) respectively. Nominal Mix : These mixes belong to fixed cement aggregate ratio which certify sufficient strength to the concrete. M5, M7.5,M10,M15,M20 and M25 are defined as nominal mixes. Because of changeability in mix, the workability and compressive strength of these grades may vary. The ratio of mix is necessary, when the estimation of concrete is made. Design Mix : In these mixes, the feasibility of the concrete is indicated by the designer but the producer of concrete define the mix proportions even though the least cement content can be disposed of. This is most logical method for choosing mix proportions with definite materials in mind covering comparatively unique characteristics. Standard Mix – In this type of mix, the concrete is blended with the ratios of 1 part cement, 2 parts sand, and 4 parts coarse material.